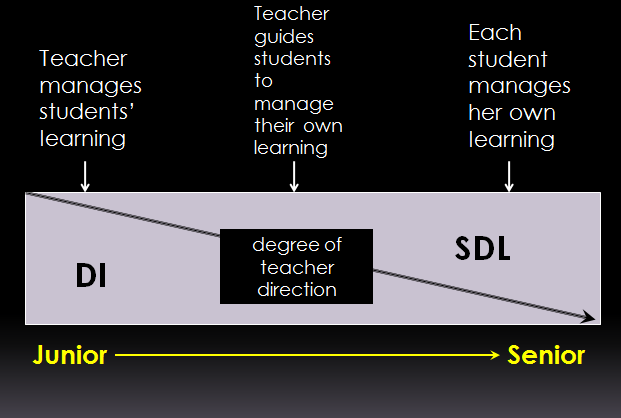 As students mature and have had engaged learning opportunities they will seek the intrinsic rewards of SDL either through necessity or excitement of subject matter. What you have envisaged is the absolute ideal. Ideal. Differentiation seems extremely difficult in theory, but once an instructor begins to implement, it gets much easier. Imagination is awakened in instructor and student… and learners respond so agreeably to teaching that respects their needs and interests that they instinctively take a larger role in their own learning. Later, the primarily self-directed learning, in my view, needs to include ample opportunity for independent study in areas that interest the learner(s) most…and this will organically lead to connections with other areas on the knowledge map. The challenge is getting past an “accountability” culture where instructors and administrators fear all material has to be the same and all learning at a lock-step, synchronized pace for the group. I hope we reach the destination you’ve laid out here. That would be a HAPPY place.